Google today released an update to its Android app for Google Voice, a free phone management service that provides U.S.-based users with a single 10-digit number for all of their phone lines, including cellular, landline and VoIP. The revised app adds two new widgets to Android's home screen, thereby making it easier for users to access Google Voice's inbox and settings. 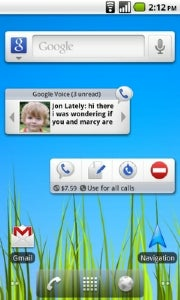 The Inbox widget displays the user's most recent voicemails and text messages on the home screen. "You can now quickly flip though messages in your Inbox with the widget, and selecting any message preview will open it in the Google Voice app," wrote product manager Marcus Foster on the Google Voice Blog. The Settings widget, the second home-screen addition, features four icons that provide fast access to key features including: 1) the full Google Voice app; 2) a free text-messaging tool; 3) calling preferences; 4) the Do Not Disturb setting that routes incoming Google Voice calls to voicemail. The updated Android app is yet another example of the mainstreaming of Google Voice. It was only three months ago that Google opened up Google Voice to the general public (at least in the U.S.); a month later it debuted the first Google Voice mobile apps. And in August the search behemoth integrated Google Voice with Gmail, a service that allows Gmail users to make free calls to cell phones and landlines in the U.S. and Canada. With today's introduction of new home screen widgets for its Android app, Google Voice is rapidly becoming a more integral part of the mobile experience. What's next?